Central Bank Southwest Florida presents YMCA Rebuild IT, an event to raise funds to rebuild the Naples YMCA, which was destroyed by a fire in early September 2013. 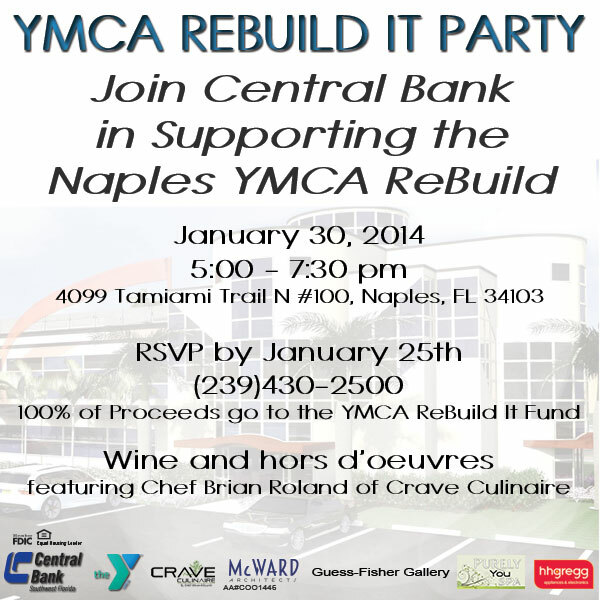 This fundraiser will take place on Thursday, January 30, 2014 at the Central Bank Naples branch, located at 4099 Tamiami Trail N, #100 from 5-7:30 p.m. RSVP is required please call 239-430-2500. After a tragic fire damaged the Naples YMCA on Labor Day, making it unfit for members to use, the facility has been closed until it can be rebuilt. The Naples YMCA serves as an important location for community fitness and activities, as well as a safe general meeting spot for Naples residents. Central Bank Southwest Florida is doing their part to help restore this important community center by raising funds for the rebuilding project. Enjoy a night of wine and food while raising money for a great local cause. YMCA Rebuild IT will feature food from Chef Brian Roland of Crave Culinaire. Roland has worked as an executive chef at some of Southwest Florida’s hottest restaurants, and he now brings his trendy culinary creations for party guests to enjoy. For more information or to RSVP for this event, call 239-430-2500. Central Bank is an FDIC insured community bank based out of Twin Cities, Minnesota with 20 locations serving the Greater Twin Cities Metropolitan Area of Minnesota, Western Wisconsin and Southwest Florida. The overall strategy for Central Bank has always been to provide a higher level of personalized service than is generally available from larger banks. Central Bank delivers localized personal service combined with widely established technology-based services to provide convenience and easy access for its customers. Central Bank Southwest Florida takes an active role in the community by providing free seminars on identity theft, financial literacy and credit repair for all that need this service. Call and book your free seminar today. Seminars are available Monday through Saturday; mornings, afternoons and evenings. Florida branch offices are located in Fort Myers at 1520 Royal Palm Square Blvd. #100 and Naples at 4099 Tamiami Trail N, Suite 100. For more information call 239-430-2500 in Naples or 239-274-1900 in Fort Myers, or visit www.centralbnk.com. Member FDIC. Equal Housing Lender.